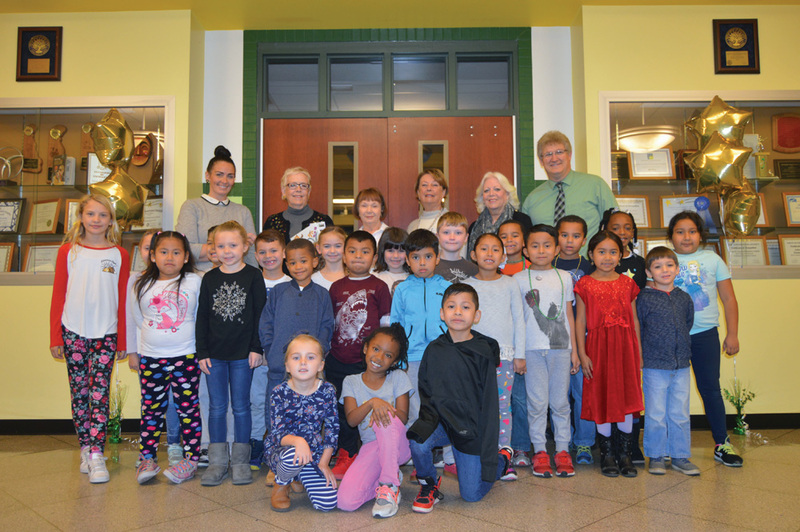 Students in Stephanie Syphard's first grade class were joined by members of the Home and Garden Club at The Refuge at Dirickson Creek on Thursday, Dec. 6 when the club presented the school with a check to be used for maintenance of the school's garden. Shown with the class are, back row from left, Principal Allisa Booth, club president Pamela White, club vice president Sandy Murphy, club secretary Nancy Scheffey, club treasurer Ramona Bourque and Vice Principal Bennnett Murray. The garden at John M. Clayton Elementary School might be a little drab for the next few months, but with a recent contribution from a local garden club, students have more “green” with which to improve it. The Home & Garden Club at The Refuge at Dirickson Creek made the contribution on Thursday, Dec. 6, at the school, where they posed for a photo with first-graders from Stephanie Syphard’s class. In addition to the check, the club also presented the school with several gardening-related books for its library — from which, coincidentally, the garden can be seen through large windows at one end. “It’s kind of a nice spot to overlook,” John M. Clayton Principal Alissa Booth said. The garden received a major overhaul last summer when local Boy Scouts did an intensive cleanup of the beds, Booth said. In addition to just being a peaceful spot that’s pleasant to look at, Booth said, the garden is also used in science classes, for studies including weather, insects and vegetation. Students also use the garden for inspiration in art class, she said. “With this donation, we can make it even more pleasant,” said Booth. White said the club supports the surrounding community through volunteer hours or donations for various projects, such as the school garden. “We wish to encourage young people to learn about growing food and to learn about caring for the soil, native plants and how to support a healthy environment,” she said. Residents of The Refuge at Dirickson Creek have also partnered with schools in the Indian River School District in a backpack project, through which more than 70 backpacks were provided at the beginning of the school year to students who would otherwise have no school supplies or appropriate backpacks. Nancy Sheffey and school counselors organized that huge project with donations of filled backpacks from residents of The Refuge at Dirickson Creek. The community’s residents also provided funding for eligible students at John Clayton School to purchase books at the school book fair. The club also supports the Delaware Botanic Gardens at Pepper Creek and beautification projects within the Refuge at Dirickson Creek, where the club is based. The club is made up of residents of the community HOA, but guests are welcome to attend meetings, craft demonstrations, speakers and field trips.